It is of course possible for any manufacturer to have a quality problem from time to time, and this is why there should be on-going testing and auditing of safety equipment. But the further problem with EN 1384 is that no organisation has direct responsibility of assuring conformance to EN 1384. In other words, Standards Australia (now called SAI Global) supervises AS/NZS 3838, but there is no equivalent body for EN 1384. Some manufacturers of EN 1384 recognise these many shortcomings of EN 1384, and voluntarily submit themselves to an independent Certification scheme. But many, particularly in low wage countries, choose not to having any independent on-going checking of their helmets. To legally sell a bike or motorbike helmet in Australia, the helmet must be fully Certified to Australian Standards. Yet with respect to equestrian helmets—it is open slather. 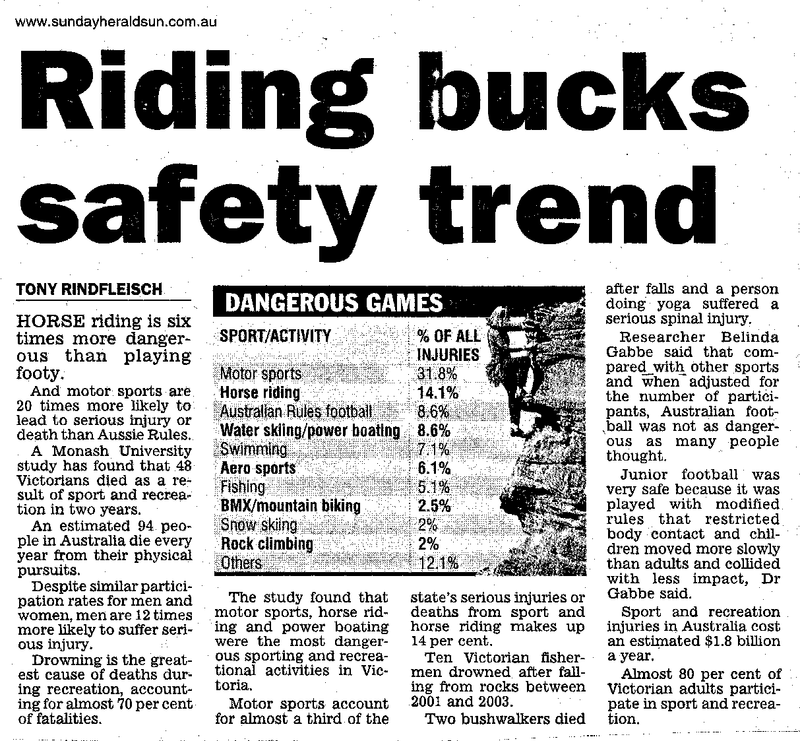 Horse riding is a very dangerous activity as the article to the right shows, so we find it difficult to understand why equestrian helmets are not treated the same as bike and motorbike helmets. So we are hoping that by raising this issue, it catches the attention of independent bodies such as SAI Global, the ACCC, equestrian associations, insurance underwriters etc, as well as riders in general. We think that many in the equestrian industry have assumed that EN 1384 is the same as AS/NZS 3838. We hope you can now see this is not true!